Drink Coffee. Change the World. Easy. CAFÉ FOR CHANGE is a startup with a social mission and a global community of coffee lovers who cannot remain indifferent to the continuing poverty in coffee production. We love coffee and those who produce it. We offer coffee lovers the best coffee and an easy way to change the world at the same time. Today less than one cent per cup of coffee sold in developed nations helps eradicate poverty in coffee growing communities. That is why most of them live in poverty or in extreme poverty. The largest coffee companies send billions of dollars in profits to Wall Street, to Swiss bank accounts and to wealthy investors. Sadly, these tens of billions in added value, profits and taxes do not reach the 26 million people who work in coffee plantations, their families or the 250 million people in coffee-producing countries whose livelihood depends, directly or indirectly, totally or partially, on the production of coffee. With CAFÉ FOR CHANGE you can transform the coffee machine you use in your home or office into an engine for change to help eradicate poverty with 10CentsPerCup every time you drink a coffee. CAFÉ FOR CHANGE will offer, from November 2018 onwards, top quality single origin coffees, packaged in biodegradable and compostable coffee capsules that are compatible with the most popular coffee systems. 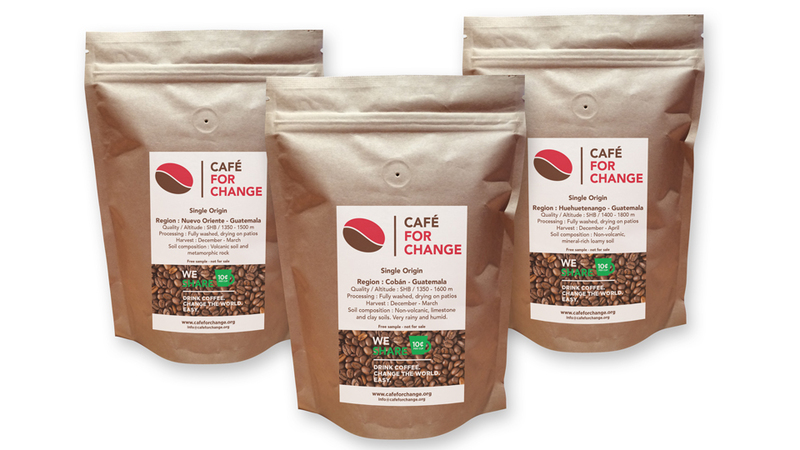 CAFÉ FOR CHANGE will also deliver: coffee pods, ground coffee and whole beans to homes and offices. All CAFÉ FOR CHANGE products are of the highest quality and, most importantly each of our Nespresso* and K-Cup* compatible capsules includes a 10CentsPerCup compensation for the coffee growing regions. * Nespresso and K-Cup are registered brands not associated with CAFÉ FOR CHANGE. I am writing to you to request that the United Nations audits the impact of its supply chain in the Sustainable Development Goals that it supports and promotes. I also request that you encourage every government and multilateral institution to do the same. Today less than US$0.01 per cup of coffee, tea and chocolate consumed by United Nations personnel in New York, Geneva, Vienna, etc, helps reduce poverty in the rural areas that produce them. The shared value of so-called ‘fair trade’ products is both insignificant and unacceptable, and perpetuates a cruel form of ‘poverty light’ in the people that produce them. This amount represents more than 30 times the premium of what some dare to call ‘fair trade’. Compensation of 10CentsPerCup consumed in developed nations could dramatically improve the lives of hundreds of millions of people whose livelihood depends directly or indirectly on the production of these three commodities. 10centsPerCup could bring living wages, running water, education, proper healthcare and even crop insurance and social security to all farmers and farmworkers. Were you personally to decide, as a symbolic gesture, to share compensation of 10CentsPerCup of coffee, tea and cacao with the communities that produce them, this could end up being a watershed moment that transforms the neo-colonial and exploitative business models of these and other industries. Exemplary leadership is required at this time. The United Nations sharing 10CentsPerCup institutionally would trigger a global debate about how we must put an end to consuming products that depend on abusive labour practices and exploitative business models. You know very well that 10CentsPerCup is an insignificant amount compared to the average income of UN employees and all diplomats. Today there is hunger, malnutrition and unacceptable levels of infant mortality in the coffee, tea and cacao lands. In the Ivory Coast, the world’s leading producer of cacao, a baby girl has a higher probability of dying before reaching age one than ever graduating from secondary school. Your mandate expires in a few months but you can still leave as legacy a United Nations that will be known by the impact of its exemplary actions and not by its many meetings and multiple goals. How many cents per cup of coffee consumed in developed nations help eradicate poverty in coffee growing regions? 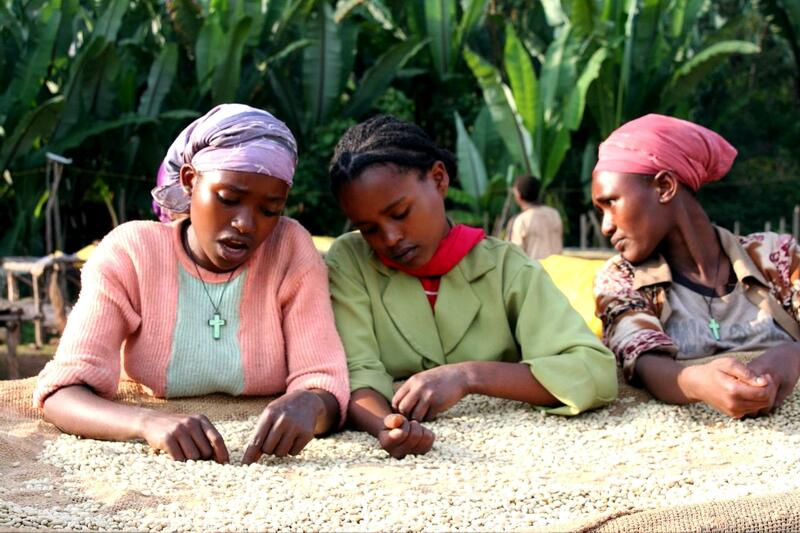 Almost every cup of coffee we drink helps perpetuate poverty in coffee growing regions. The business model of most of the coffee industry is outdated and exploitative. The compensation received by the coffee farm workers and others who depend directly or indirectly on its production has no relationship to the price coffee lovers in developed nations pay for a cup of coffee or to what it costs to produce it. Because we love coffee, we can’t remain indifferent. If you love coffee... You can help eradicate poverty. Liebe Frau Merkel, stoppen Sie beim G7 die Ausbeutung der Kaffeebauern! CAFÉ FOR CHANGE needs all the help it can get from talented professionals. If you have unique talents and a sense of mission, a graduate degree, between 5 and 15 years of professional experience and a proven successful track record in our industry, in major companies in FMCG, in-on line sales; in incubating, financing, crowdfunding and nurturing start-ups; in marketing or in communications, CAFÉ FOR CHANGE would like to hear from you. Please send us your CV and state why you are interested in supporting with your time an emerging COFFEE START UP created to compete with the largest coffee companies. CAFÉ FOR CHANGE will challenge them on shared value for the weakest link of their supply chain, quality, customer satisfaction and real sustainability. CAFÉ FOR CHANGE is a global community and a business with a unique sense of mission we have been conceived to eradicate poverty in coffee growing regions. Our success will be measured by how we change the way our largest competitors do business but especially by the impact we have in transforming an industry built on poverty into one that becomes a global agent for eradicating it. Only volunteer opportunities are available at CAFÉ FOR CHANGE at this time. A limited number of full time employment positions will be announced in September 2018.